OH. MY. GOSH. I was just browsing watches at a website (TheWatchery.com) and my jaw droppped open when my eyes saw this honking baby. THAT, ladies and gents, is a real watch! Isn’t that the most gorgeous hunk of timepiece you’ve ever seen?! 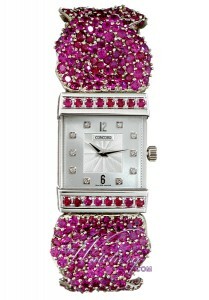 When I am rich, I’m going to get me one of those pretty pink luxury watches. My eyes are stinging just from looking at so much.